A new study has revealed for the first time the last 500-year flood history of the Mississippi River. It shows a dramatic rise in the size and frequency of extreme floods in the past century—mostly due to projects to straighten, channelize, and bound the river with artificial levees. "The floods that we've had over the last century are bigger than anything we've seen in the last 500 years," said Sam Muñoz, a former postdoctoral scholar at WHOI and the lead author of the study, published April 5, 2018, in the journal Nature. The research shows that in the past 150 years, the magnitude of the 100-year flood—a flood that has a 1 percent chance of occurring in any given year—has increased by about 20 percent. 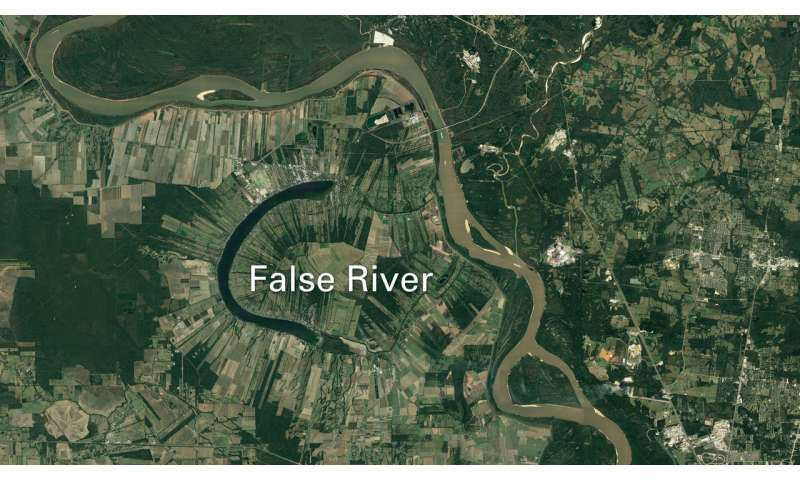 The research team found that about three-quarters of that elevated flood hazard can be attributed to human modifications of the river and its basin. "There's been a longstanding question about the extent to which all the changes we have made to the Mississippi River—one of the most engineered rivers in the world—have altered the probability of really large floods," said Muñoz, now an assistant professor at Northeastern University. The grain size in the layers provides clues to the size of the floods. The larger the flood, the more energy is generated by the river water, and the larger the grains that get deposited in the lakes, said WHOI geoscientist Liviu Giosan, another lead member of the research team. By analyzing grain size and flood size for known flood events—for example, the Great Mississippi River flood of 1927—Muñoz could estimate the sizes of previously unknown floods represented in the sediment cores. To find out when those floods had occurred, the team used isotopes of lead, cesium, and carbon to date the coarse sediment layers. Zhixiong Shen of Coastal Carolina University used a technique called optically-stimulated luminescence—which determines a material's age by analyzing when it was last exposed to sunlight. Matthew Therrell of the University of Alabama used annual tree rings to reconstruct a detailed record of more recent regional flooding. Combining these methods, the team traced the history of floods back over 500 years—about 350 years further back in time than the oldest written flood records.